The inside story of today's Dambusters, 617 Squadron RAF, at war in Afghanistan.In May 1943, 617 Squadron RAF executed one of the most daring operations in military history as bombers mounted a raid against hydro-electric dams in Germany. 617 Squadron became a Second World War legend. Nearly 70 years later, in April 2011, a new generation of elite flyers, now flying supersonic Tornado GR4 bombers,… was deployed to Afghanistan - their mission: to provide close air support to troops on the ground.Tim Bouquet was given unprecedented access to 617's pre-deployment training and blistering tour in Afghanistan. 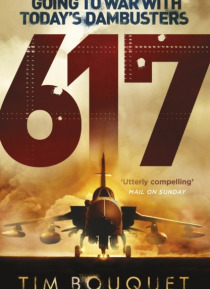 From dramatic air strikes to the life-and-death search for IEDs and low-flying shows of force designed to drive insurgents from civilian cover, he tracked every mission - and the skill, resilience, banter and exceptional airmanship that saw 617 through.